Enter desired name/text. If no personalization is desired type "NO NAME". Any symbol you type will be part of the end product. It you do not want quotes/punctuation/symbols please do not type them in the box. 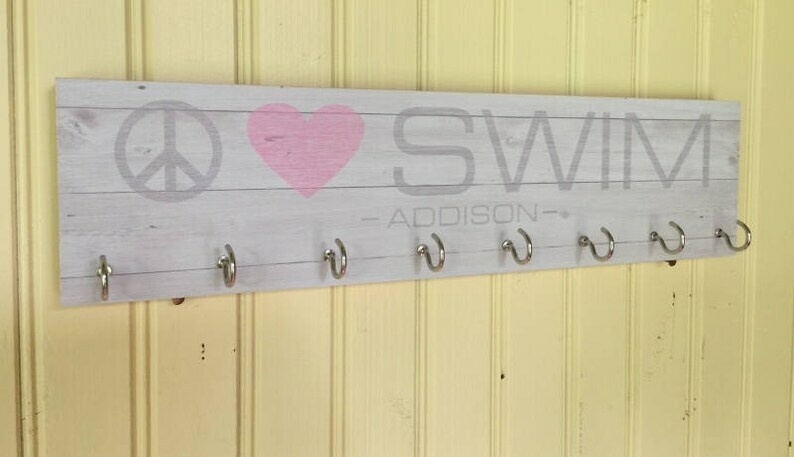 Show off that swimmer's swag with this unique solid pine wood sign with hooks for hanging medals, ribbons & awards. Also great as jewelry hangers, key hooks, etc. CUSTOMIZATION AVAILABLE: If you are looking for a custom design, statement, name, size, shape, etc., please use the "Request Custom Item" option on the left side of the store page. Perfect! My daughter LOVED it and it was well crafted and nicely made.